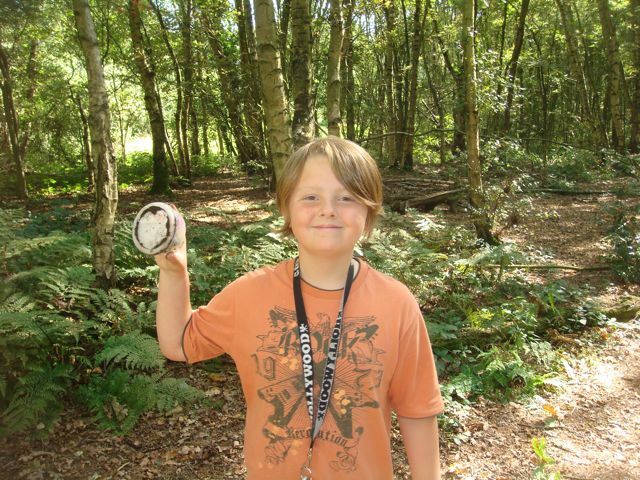 Isaac had a day off Saturday school this weekend so we both were looking forward to a great day out caching together. The weather was looking good due to the high pressure system that is sat over the UK at the moment so we settled on a set of caches along the Oxford Canal right by the border of Warwickshire with Northampton. 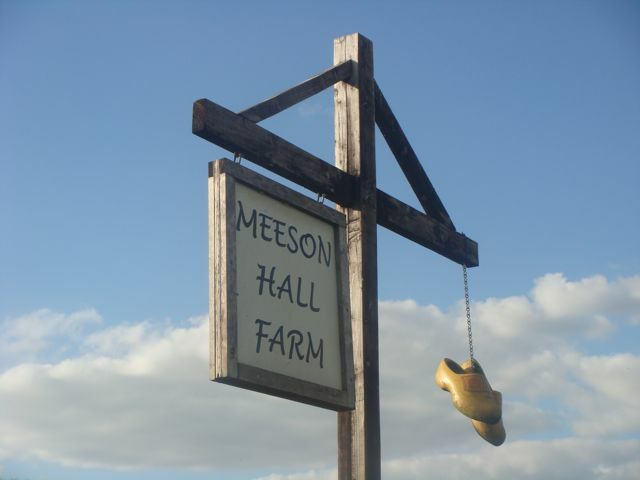 We soon arrived at the first cache in the hamlet of Marston Doles. As we drove up, we spotted some handy parking right by the canal bridge – perfect! We got our bikes out of the Jeep and off we set. The first cache was a nice easy one to get us started. There was only one place it could be and indeed that’s where it was. We then headed off along the canal towpath picking up caches as we went. All nice easy finds and all nice sized boxes, just the way we like them. We’d planned the first part of the day to be a circular bike ride, coming off the canal near Priors Hardwick and then up to the village and back to where we started via footpaths across the fields. We were not sure if we’d manage to get the bikes down the paths on the return leg but we need not have worried as most of it was hard pack tracks, with only a few fields to walk the bikes through along the way. Once back at the Jeep, we got back on the towpath for the 4 caches to the north of where we’d parked. The first one was muggle central when we arrived so we decided to save it for the return leg. The other three were nice easy finds – the only thing of note was a collapsed towpath at one point, making the path only about 1ft wide. On the return leg, the first cache was deserted so we had a nice quick find. Next, we drove round to the village of Priors Hardwick to grab a quick cache by the beautiful village church. A short drive down the road and we were at our first of the Alphanumeric Northants series. This seems to be a mirror of Messe’s excellent Alpha Quest in Oxfordshire, which we’d enjoyed finishing absolutely ages ago. We’re trying very hard not to get drawn into this series as well as Messe’s one had us doing stupid things like driving from Shropshire to Cambridge to Winchester to Oxford, all in a day and all just to pick up two essential TB’s we needed for the series. After a short drive down to the next canal stage at the start of the Spice series, we stopped to have our sandwiches. Suitably fortified we set off on our bikes along the towpath for more caches. Nothing much to report along here apart from a very thorny path with hawthorn bits and pieces all over the place. It was only a matter of time before we got a puncture and indeed just before the last cache of this stretch Isaac got a front tyre puncture. We stopped to mend it and noticed his back tyre had gone too. Some time later I had them both fixed and off we set, a bit more carefefully this time. Not careful enough though as he had yet another puncture within a few minutes :-(. We walked the bikes up to the bridleway over the fields (which was the quickest route back to the Jeep) and stopped to fix the puncture. I then spotted that I’d got a front tyre one myself – hmmmm! With about an hour wasted on punctures in total we were very glad to be off this section of towpath and were soon back at the Jeep. Just time for a few more caches before heading home so we drove round to the next section of canal caches, hoping the towpath would be better here (it was!). As we pulled up, the area looked familiar as we were sure we’d been here to do other caches absolutely ages ago. We walked down the path to the canal and sure enough, we’d been here to do a set of Oxford Canal caches by a cacher called theblack. We had five caches along this part of the canal to do and apart from the first one, all were nice and easy as I think whoever had set them had re-used some of theblack’s locations. Everything was *very* familiar to us both. Time was getting on by now so we headed back for the Jeep for the drive home. Isaac was navigating and took us via a final two caches along yet another canal towpath. This time we walked them as we could not be bothered getting the bikes out one more time and fancied stretching our legs before the drive home anyway. The first was a quick find, the second took a bit longer but was a belter of a hide and easily the best hide of the day. 40 finds for the day, which is very satisfying. We’ve both had a cracking day out (despite the punctures). We were child free this afternoon so we set off to visit the local dog’s home to see about a new dog. Unfortunately they had nothing to suit so we’ll have to try again another time. As we had both the dogs with us in the car and the closest unfound to home was at Haughmond Hill, which is a perfect dog-walking area, we decided to kill two birds with one stone. We parked up in the main car park and set off along the paths through the woods to the cache. It took me quite a while to grab the cache as the nearby path was busy with Sunday afternoon walkers and I kept having to stop searching while they went past. Pesky muggles! I eventually found the cache in the really obvious place that I’d looked at first, but obviously not hard enough. We then carried on our walk to make it circular. The dogs absolutely loved the walk in a place they have not been to many times. After dropping the dogs off at home and having a cuppa, we set off for another walk near home to explore an area where they have just put in a new pedestrian bridge over the River Meese. We took a cache along just in case there was anywhere suitable for it. We’ve wanted to put a cache out here ever since our other Meesechievous caches were set so we’re glad the area has finally been smartened up and the cache is now in place. I’ve submitted the cache this morning so let’s see how long it takes to get published. Isaac had his first Saturday at his new school today so as the weather was so nice I decided to pop out on my own and have a day out caching. Lots of new caches seem to have come out around Wolverhampton so it seemed like a logical place to aim for. The first target for the day was a series of about 10 caches called Moseley Meander. On the way I picked up a quick drive-by by the M54 and then was soon in the Country Park car park getting ready for a nice walk around the Moseley caches. I recognised the area from a previous cache of snerdbe’s which we did in the very early days of our caching. The first cache was an easy find – I noted that the Soggy Campers had found it already today, so was wondering how far ahead of me as it was still quite early. I did not have to wait long as I spotted them as I walked up to the second cache. Great to meet you both. They mentioned they could not find this one and returned to it with me to double check. Sure enough it’s nowhere to be seen, so that’s the first DNF of the day logged! I walked on to the next cache with them, chatting away about caching as we went. Another easy find was had here before we both went on our respective ways. I then carried on along the loop of caches back to the car park with nothing much to report other than lots of very easy finds. I then drove round to a closer place for the final two caches of the series and walked in for two more quick finds. Next, I had the new Essington Moat caches on the list and so off I set. I could not spot the first one at all despite a really good hunt round the area of GZ. That’s another DNF to add to my logs! Thankfully the next two caches were nice and easy with the final one being in some woods I’m sure we’ve been to for a snerdbe cache a long time ago. As I was walking back to the Jeep the familiar face of Andy from AndynElaine was coming down the field. Great to meet you again :-). Next I had planned a few quick drive-by’s before heading off into deepest Wolverhampton for more caches. One of these was at the end of a trail of 4 caches which seemed to not use any marked paths on my OS map. As I arrived I saw they were connected by a nice hard pack path and were along a lovely linear nature reserve. The sun had just come out and I could not resist a beautiful walk along the old canal to find them. All nice quick finds. As I was walking back to the Jeep I could see a couple in some bushes by a cache I’d found earlier so crept up behind them and shouted “HAVE YOU FOUND IT YET?”. After nearly jumping out of their skins (:-)) I was to meet Suebedz. Great to see you too! That’s three caching teams bumped into today and it’s not yet midday :-). A quick and unremarkable Sidetracked cache followed before I headed off to Willenhall to try for a new series there. On the way I got a PAF call from some caching friends from Newcastle Under Lyme on a cache we did ages ago near Bolton. Thankfully I could remember where the cache was and had them with cache in hand in no time. I struggled to find anywhere to park for the Willenhall caches and it was taking longer to park up than it was to find the cache. Double yellow lines, double red lines, one way systems, road works – they all conspired to make this a frustrating part of the day so I decided to knock it on the head after 3 finds and move on to somewhere quieter (and more rural). On the way I could not resist a quick return to find the two DNF’s we had a few months ago on snerdbe’s canal series on the west side of Wolverhampton. Both were quick finds for me today and I managed to bag another cache at an old bridge on the way between the two. I’d been looking forward to Scooby, Scrappy and MP’s new cache series near Pattingham all day as they always have great hides and are always a good walk. I was not to be disappointed today either! I started by parking up at the southern end of the caches and heading off up the Monarch’s Way on a lovely circular walk round just over half of the series. 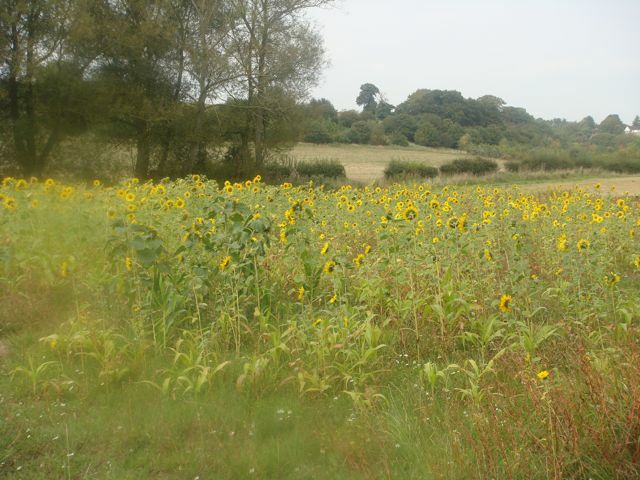 Highlight of the walk was coming round the corner of some woods to be confronted with a lovely field of sunflowers, which looked absolutely fabulous. Lowlight of the walk was going base over bayonet in my enthusiasm to get closer to the sunflowers once I’d seen them. I’d glad no-one was around to see my attempt at unpowered flight ;-). After I got back to the Jeep I drove round to the southern end of the top part of the series via a lane with a ford that was marked as “not suitable for cars”. This is normally a good sign that the lane is *very* much suitable for 4×4’s and indeed this one was. I loved driving along through the water in the ford, which extended down the road for quite some length. After finding somewhere safe to park, I set off for the final 3 caches of the series, which were all easy finds. The last one was very close to somewhere we’ve been in the past for a Washers cache that is now archived (or at least I assume it is). Somewhere along the series I found the bonus cache, which was in a ready made spot for a cache. I still had an hour or so spare so headed off to find the 4 remaining caches around Chillington and Brewood, near to the in-laws house. All nice quick finds, with the last one being my favourite as it was a nice long walk into the middle of nowhere in particular and was perfectly peaceful. 37 finds for the day and a lovely day out in some lovely countryside. I had to pay some cheques in at the bank and the nearest branch is in Stafford, so I decided to find a few caches on the way home to make the trip a bit more interesting. After I’d finished at the bank I headed off for the first two caches which were by the River Sow, near the town centre. I parked up at Morrisons and walked along the river to bag the two easy caches. Next, I moved the Jeep round to park close to a canal in the suburbs and had a short walk to another cache. From there I went off to find another canal cache. There was no obvious place to park for this one as it was set by a narrowboater so I ended up at the end of a dead end lane and walking through a farmyard (which I later realised was not a Public Footpath!) to the canal. Thankfully the cache was a quick find and I was back at the Jeep really quickly. 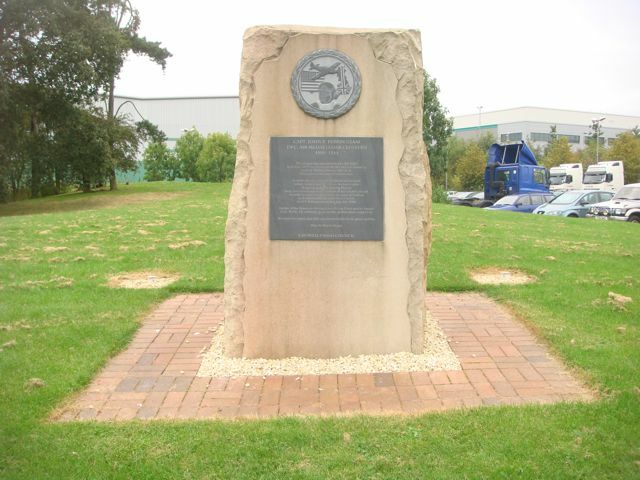 A short drive up the M6 to the north side of Stafford saw me looking for a quick cache by a memorial to an American WW2 fighter pilot who crashed his plane here whilst attempting to avoid hitting the houses in the town. It was now time to start heading home so off I set, but not before grabbing another 3 quick caches. All easy finds and a lovely longer walk for the last cache to a great little hidden location I’d not have known about otherwise. 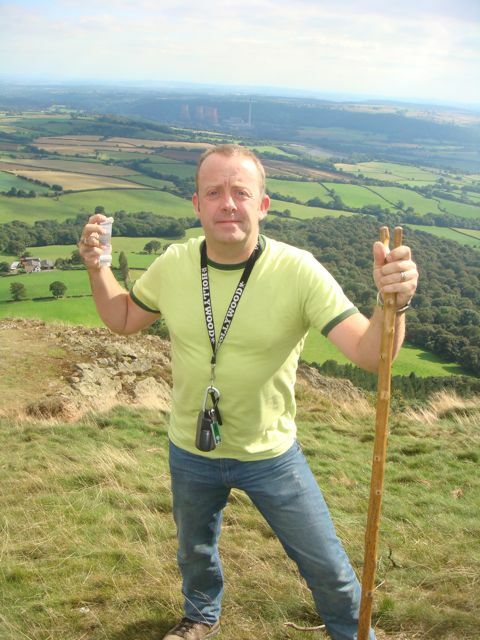 Every time we go up The Wrekin you can almost guarantee that a few days later, a new cache will be published up there. It’s happened a few times in the past now, which is really uncanny and almost if someone is watching over us (which of course they are not). Anyway, the last time this happened we decided to leave the cache as we knew as part of the first week at Isaac’s new school the whole school goes on a walk up The Wrekin. Families are encouraged to come along too so I knew it would be a great time to bag the last cache we have to do up there. We had a lovely walk up the hill, chatting away to lots of new parents. As we got to the summit, you could see the whole school gathered round the new Year 7 pupils cheering them and getting their photos taken. They then all set off down the hill to the waiting coaches and back to school, so myself and Mrs Bolas Heathens headed off the short distance to the cache. I’d seen it was an unusual container and that the cache was set for someone’s 30th birthday, so was expecting a fake cake or something like that. I thus nearly passed the cache over as it was in fact something very different. I won’t say any more here as I don’t want to spoil it for future finders. We then headed off down the hill, chatting away to more parents and drove round to the school for refreshments. As we arrived, we realised we had forgotten there was a charity event on and quite a few celebrities were taking part. Off we went to see who we could spot, which should be interesting as I never usually take any notice as to who is who on TV. We managed to spot Chris Tarrant, Nick Hancock and Robert Powell from Casualty. There were a few other faces that looked familiar but I’ve no idea who they were. 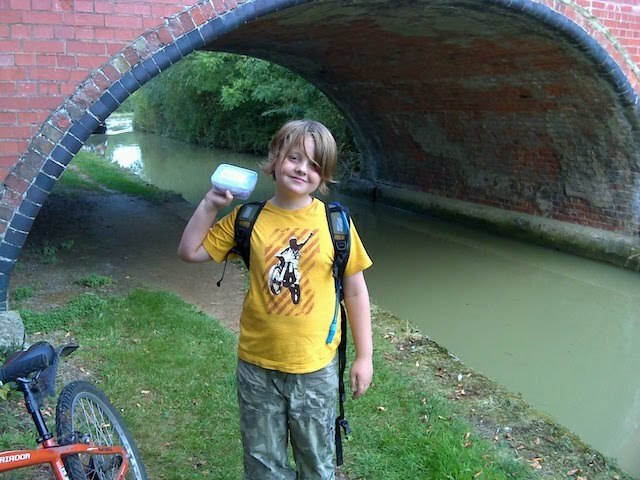 Isaac has started secondary school this week and so we decided to go for an easier day out caching this weekend. Starting next week, he’ll be doing Saturday activities at school so won’t be able to come caching as often as we’d like. Hopefully this is not the end of an era and he’ll still have enough energy (and time!) left to come out caching on Sunday’s, even if it’s every couple of weeks. We’ve been watching all the new caches build up in the Sandbach, Congleton and Holmes Chapel areas for the last few months, so decided today was the day to go and find them as they often appear on our closest to home not found front page. We were not sure what to expect as a series based on metal railings does not sound that inspiring. Needless to say our fears were right and they were all in very generic locations by road junctions. The downside was quite a few of them seemed to be in very thorny areas too – lots of hawthorn bushes and other prickly things near railings to scratch your hands and arms with. Having said that, I know the cache owners have taken time and money to put these caches out so we don’t want to sound unduly negative as we do appreciate the smileys. There was not really much to report other than what I’ve said above. In between the railing caches, we did some Post Haste ones, which were even easier as they are all hide a key’s on the back of red post boxes. Caching really does not get much easier as they were all instant finds :-). On the way, we did do a really nice cache on the South Cheshire Way part way up the north side of Mow Cop and in a really nice spot with views over the whole of Cheshire. Easily the best cache of the morning. By lunchtime we were getting a bit bored so stopped off for lunch and an ice cream at Brereton Country Park near Holmes Chapel. Suitably fortified, we headed off towards Sandbach to try some different caches (via one or two remaining railing caches – well, we can’t just drive past them if we know they are there can we?). We were soon starting on the Crewe & Nantwich (C&N) circular walk caches, which were much more our thing. Some decent walks, nice locations and generally caching as it should be. Our only grumble would be there are too many micros in places that could hold a larger cache, but that’s not a great problem. In between the C&N caches, we stopped to do a cache at a great location where the farmer builds a sculpture out of bales of straw every year. In the past they have done a rocket, Jodrell Bank and a windmill. This year it’s a HUGE Big Ben, complete with working clocks. Very impressive indeed! I’ll shut up now as I’m beginning to sound like a right moaner and that’s not my intention at all. Not the best day out caching we’ve had, but definitely not the worst either. At least most of the caches were really easy and thus quick finds. On the upside, we did get 40 finds for the day and did clear quite a few caches off the closest to home not found list. 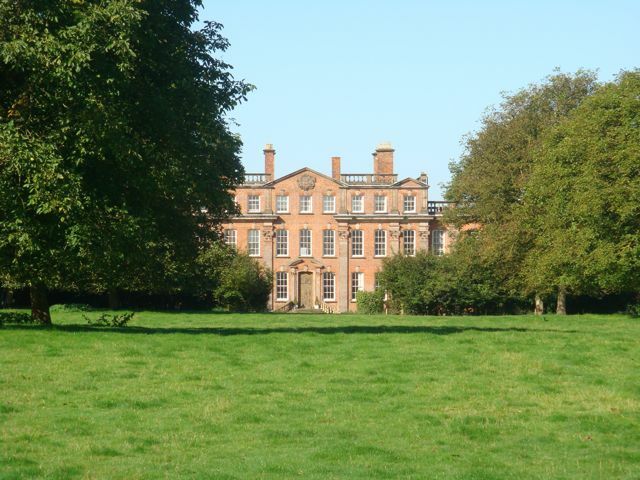 I was up early this morning and as it was such a glorious day I thought I’d go out and get our closest not found to home – BEE about Buntingsdale Hall, which is just by Market Drayton and set round a lovely old country house. We’d actually scouted the location out for a possible hide ourselves ages ago but never quite got round to taking it further so it’s great to see a cache here now. The cache was a multi, with a sneaky first stage leading to a nice big ammo box. I parked the Jeep in the same place I’d used for the nearby Drayton Daytona cache and set off on foot. I was soon at stage 1 and had a very quick find of the sneaky nano as the co-ords were bang on. A short walk later and I was at GZ for the final cache for an easy find. Loved the woods by the final cache and the interesting old buildings strewn round the fields – obviously part of the old Tern Hill WW2 airfield.